We are a community who are Catholic, Marian and Charismatic. Our mission is to bring Catholic Christians to a deeper understanding of their vocation and Mission in Christ, in the Church, and in the world. This is our community's response to the call in Saint John Paul II's apostolic letter to the laity, Christifideles Laici. Marian Servants of the Blessed Sacrament was founded in July, 1997 and approved by Bishop John Snyder, Diocese of St. Augustine Florida, as a Private Association of the Christian faithful in July, 1997. 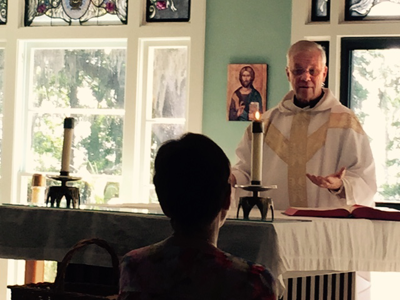 We are a community of the Marian Servants of Divine Providence in Clearwater, Florida, which is our Mother Community. The Most Reverend Felipe Estevez recognized the Marian Servants of the Blessed Sacrament as a Public Association of the Christian Faithful of the Diocese of St. Augustine in Florida on May 16, 2017. This Association is the foundation and unifying force for all the ministries gathered under the mantle of Our Lady of the Blessed Sacrament.